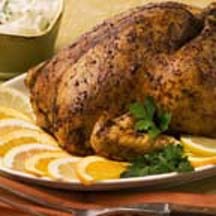 The flavorful citrus rub featured in this whole roasted turkey recipe adds extra taste dimensions your menu. It works great with other poultry too. Arrange oven rack in lowest position and preheat oven to 325°F (160°C). Grease 13x9x2-inch baking dish. Rinse turkey and pat dry; set aside. Combine oil, lemon juice, orange juice, bouillon, crushed seasoning cubes, paprika, grated lemon peel, grated orange peel, cumin, oregano and thyme in medium bowl; mix well. Rub entire turkey including under the skin and cavity with half of paste. Reserve remaining paste. Place turkey breast-side-up in prepared dish. Bake, brushing turkey with remaining paste every hour, for 3 to 3 1/2 hours or until thermometer inserted in thickest part of thigh registers 175°F (80°C). Transfer turkey to platter and cover with foil. Let turkey stand for 10 minutes before carving. Makes 12 to 14 servings. Recipe and photograph the property of Nestlé® and Meals.com, used with permission.